Aerial Yoga is a form of exercise using a fabric hammock or swing suspended from fixed points in the ceiling. Designed to give an holistic form of fitness, it increases flexibility, strength, endurance and motor skills. Aerial yoga combines benefits for the mind and body with muscular and cardio fitness alongside aerial acrobatics. 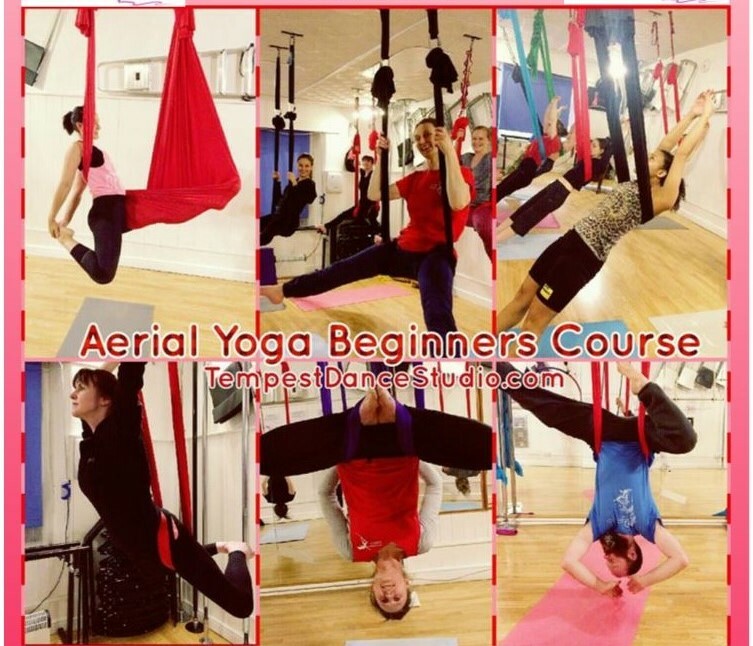 Who can take part in an Aerial Yoga class? Anyone and everyone! From those who would like more support in their traditional yoga poses, those who would like to deepen their stretches and hold their poses longer to those who would like a more vigorous acrobatic type session. Also those who just like hanging upside down wherever and whenever they can. No, you do not need to be fit to start. 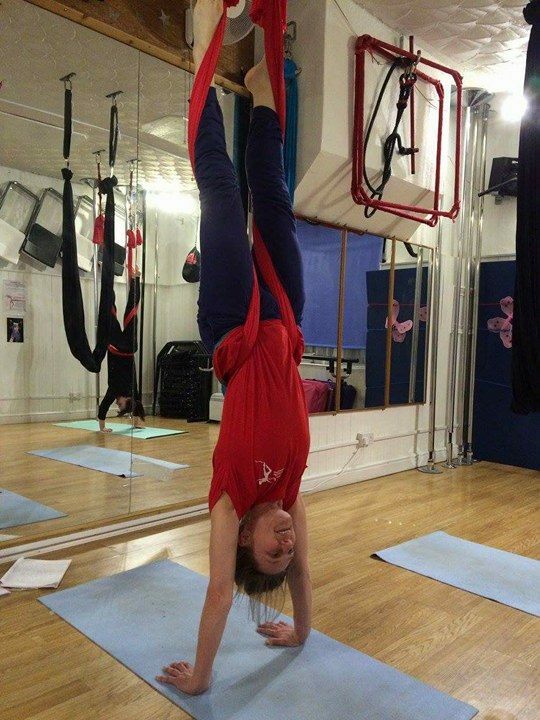 Aerial Yoga is excellent for those that have no previous exercise experience as your weight is supported in the hammock and we can lower the hammock so that you work very close to the floor. There are also alternatives to going upside down or inverting and you can do as much or as little as you need to. The mood of the class is usually very calming with relaxing background music (although some instructors prefer more of an energetic soundtrack depending on the level of the class). In most classes you can expect to have your own aerial yoga hammock but in other classes there may be two people sharing a hammock. 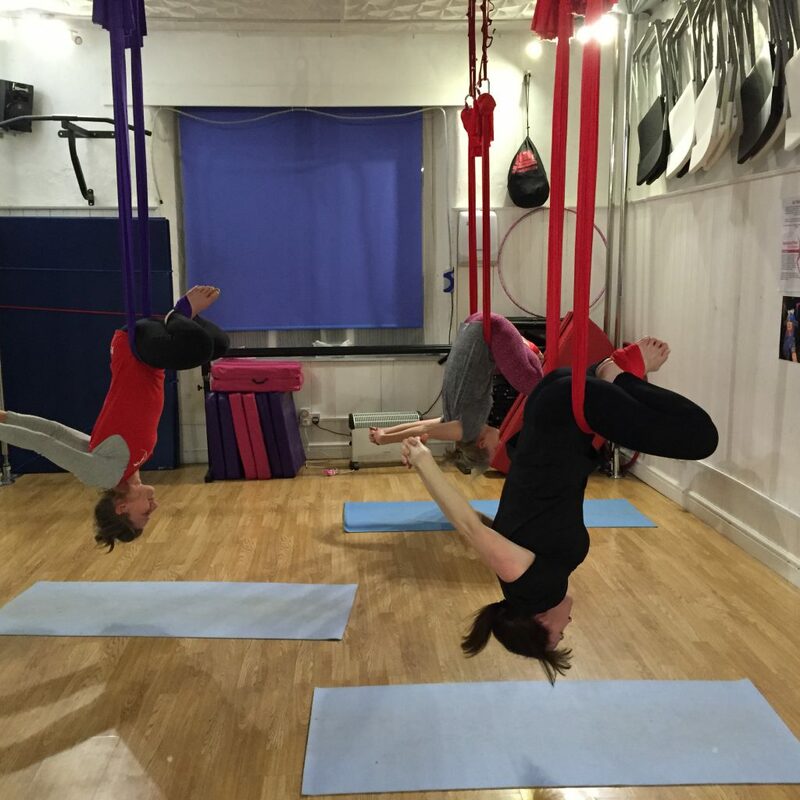 What are the benefits of Aerial Yoga? Maintains a Healthy Spine: Aerial Yoga helps to maintain a healthy spine. The exercises in Aerial Yoga can put the spine through a full range of motion which is very beneficial, especially to those sitting at a desk all day. 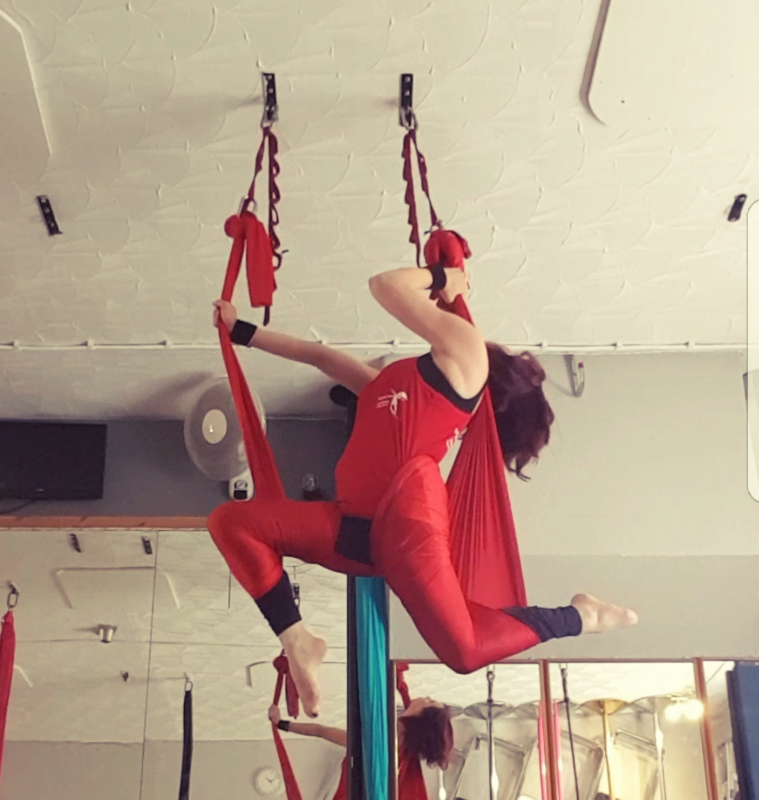 Improves Core Strength: Aerial Yoga improves the core strength in a unique way. Using gravity as resistance Aerial Yoga works to increase muscle tone safely and effectively whilst protecting the back. Decreases Stress Levels: Aerial Yoga decreases stress levels. Deep breathing activates the Parasympathetic Nervous System (PNS) decreasing stress and helping you to maintain focus during an Aerial Yoga session shutting out the world for an hour of relaxation. 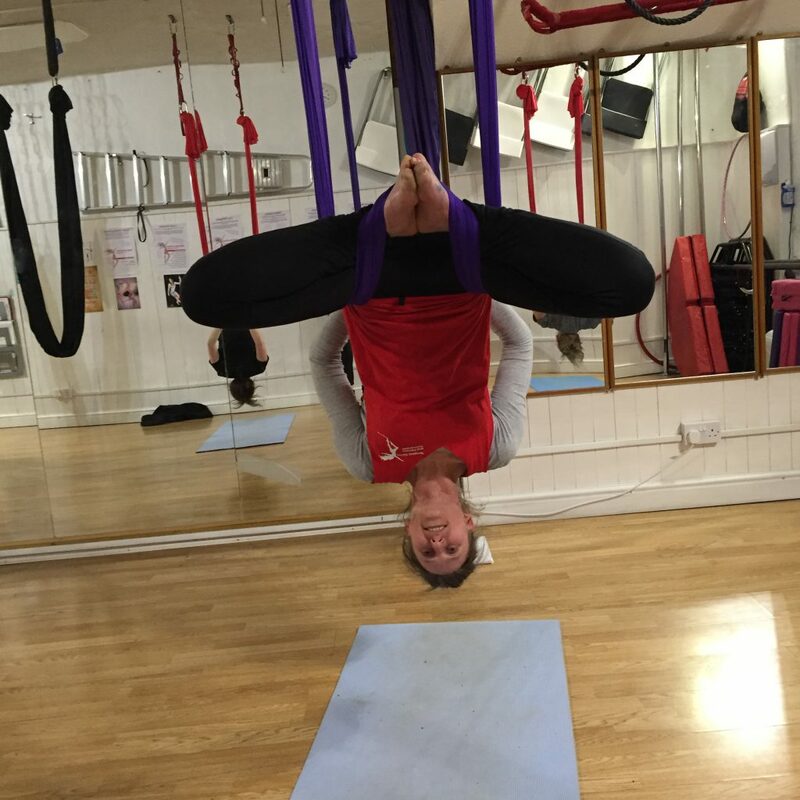 Increases Flexibility: Aerial Yoga increases flexibility and strength as you use your core, arms and shoulders to move into postures and hold them whilst focusing on breathing deeply. Suspension releases tension on the bones and muscles allowing them to move more freely increasing flexibility. 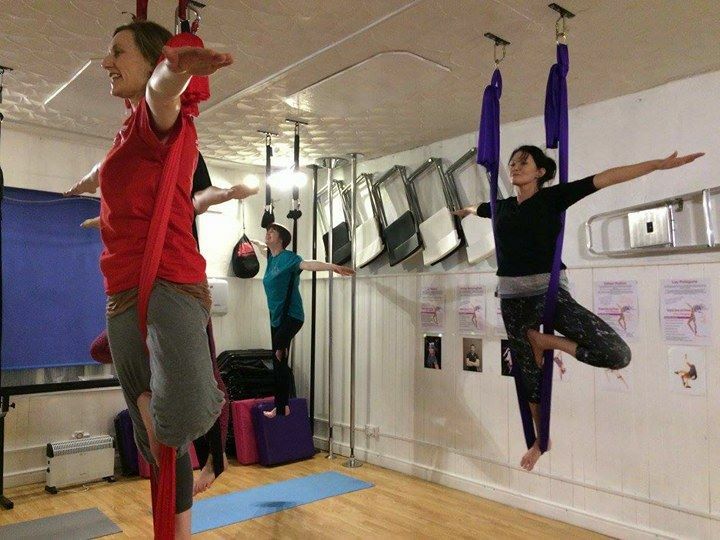 Maintains a healthy bone density: Aerial Yoga can help to maintain your bone density. Peak bone density occurs at the age of 25, after that you can help to maintain this by regular weight bearing exercise and the intake of calcium. In Aerial Yoga you are using your own body weight to increase strength, therefore helping to maintain your bone density. Puts you in a good mood: Aerial Yoga releases “happy” hormones like serotonin, endorphins, oxytocin, dopamine, boosting your mood and helping you to feel more energetic. It can also give you boosts of adrenalin. 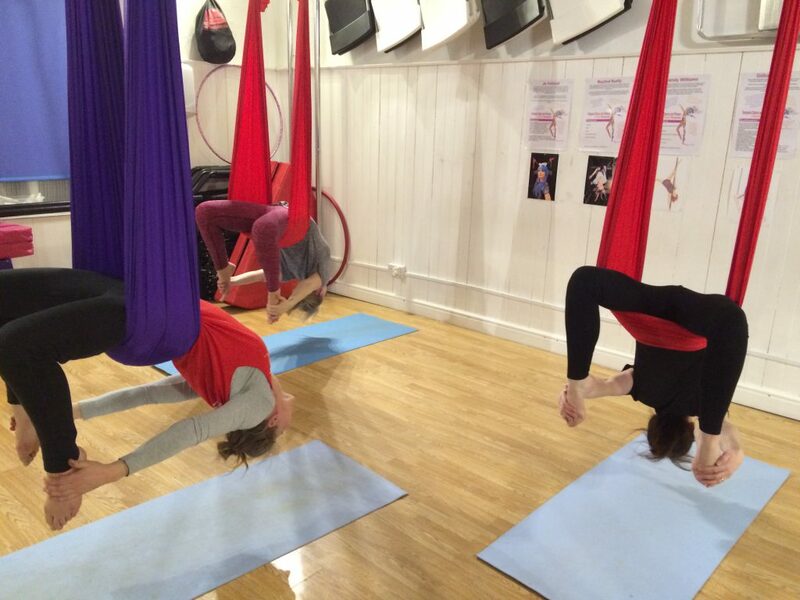 Improves blood circulation: Inverting in Aerial Yoga improves the circulation of blood. It helps to reduce swelling conditions of the legs and can even have a positive effect on varicose veins, as it relieves the pressure on these areas. Make new friends: Although you are ensconced in your own hammock for most of the session there is a very positive and friendly atmosphere as you are all working towards common goals. All of Tempest Dance & Fitness Studio’s classes are well known for their friendly, welcoming, family atmosphere.